The Japanese parlors that feature the vertical pinball machines known as pachinko usually have a section devoted to slot, or pachislo machines, which bear a passing resemblance to Vegas-style slot machines. Yamasa is the third-leading supplier of pachislo machines, and in 2010 held an 8.8 percent share of all machines installed throughout Japan. There is a one- to three-year turnaround for machines in Japanese parlors, and old ones are often sold on the foreign market as collector's items. Yamasa pachislo machines usually accept metal tokens, but you can modify them to accept quarters. Unplug the machine from its power source. Open the door with the key supplied with the machine and pull it out. You may have to wiggle the door or jerk it upwards to loosen the catch. Locate the coin mechanism on the inside of the door, just behind the coin slot on the outside of the machine. Unplug the wires, loosen the screw holding it to the door with a Phillips screwdriver and pull it out, rotating it as you do so. Insert a quarter into the front of the mechanism and observe its path as it drops through. The path should be close to one of the sides. Clean the mechanism with a cotton swab moistened with rubbing alcohol. Cut both ends off a plastic cable tie with a utility knife, making the cable the same length as the coin path. Glue it to the path with contact cement so that a quarter fits comfortably between the tie and the opposite side of the path without binding or getting stuck. Let the glue set, then reattach the mechanism to the front of the machine and plug it in. Close the door and lock it. The machine won't operate until the lock mechanism is fully engaged. Plug in the machine and test it by inserting a quarter into the slot. 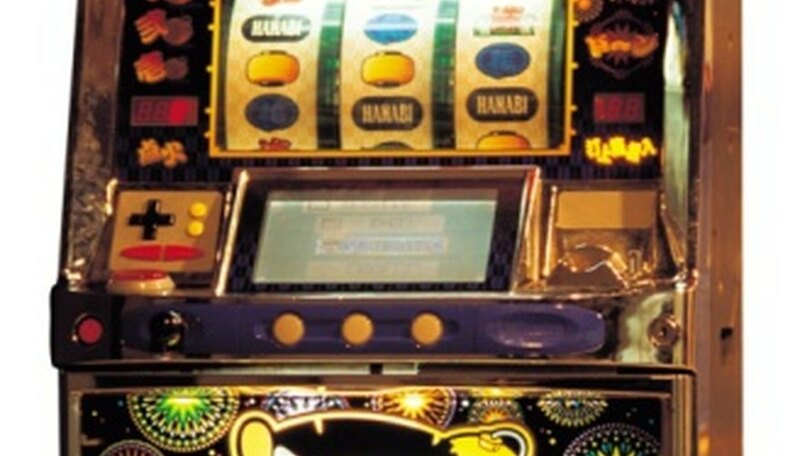 The machine should register the coin by indicating one credit on the illuminated display on the front of the machine. Each operation of the machine requires the insertion of three quarters. If the machine doesn't register your quarters, you may have to make the coin path slightly smaller. Check whether owning, operating or using a coin-operated pachislo machine is legal in your locale.